Warren Luhrs wasn’t one to surround himself with “yes men.” Instead, the man who co-founded Hunter and Silverton with his brother John chose to be around straight-shooters with integrity. That’s the view of past Luhrs president Roger Yarborough, who says the Sept. 18 death of the 69-year-old Luhrs was a complete shock to everyone who knew him and a tragic loss of a great man. Spencer Markatos, a yacht broker with South Florida Yachts who went to college with Luhrs at American University in Washington, D.C., in 1964, says anyone who knew the man would never have believed he would succumb to a heart attack. There had been few details about Luhrs’ death because his wife, Linda, wanted to wait until after his funeral. “Warren’s family was very private,” says Yarborough, who had worked with Luhrs since 1988. Luhrs spent as much time as possible with his wife and eight children, Yarborough says. He also spent a lot of time at his businesses, addressing most workers by their first name. “He commanded the respect of, I guess you’d say, his inner circle of people that he trusted and that he held close,” Markatos says. Luhrs was also a reflective and discreet person. Luhrs continued to be involved in the operation of the St. Augustine Marine Center, his one remaining business after Hunter Marine and the Luhrs Marine Group, which included Mainship and Silverton, declared bankruptcy. When the downturn struck, the brothers honored obligations by buying back inventory from dealers, of which there was a lot across the five brands. “In reality, they tried probably five years longer than they should’ve to keep it going,” he says. In addition to a passion for sailing, Luhrs was an outdoorsman who spent time in the wilderness, Yarborough says. True to his private nature, there is little press on Luhrs other than a few articles on his trip around Cape Horn or his single-handed sail across the Atlantic. “There isn’t a personality there from the standpoint of research; he kept it pretty close to the cuff,” Yarborough says. 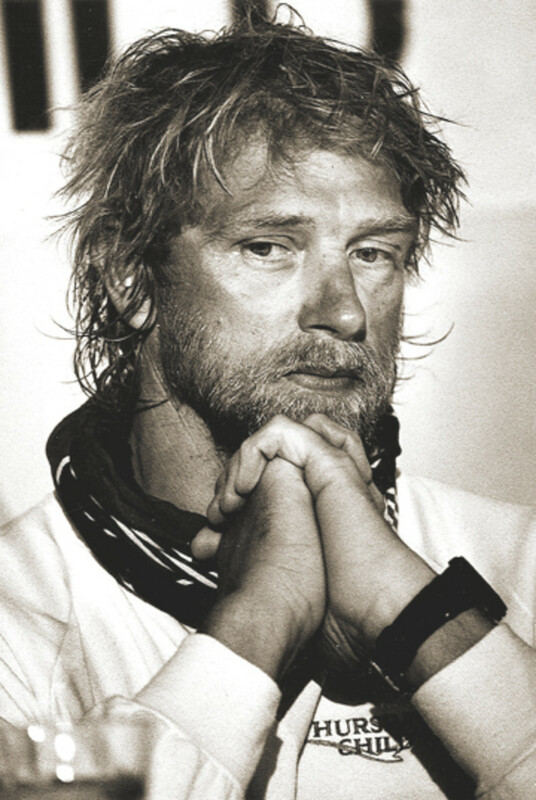 The stories that can be found at sailing website Scuttlebutt.com show Luhrs became involved in single-handed ocean racing and set many records aboard his 60-foot sloops Thursday’s Child and Hunter’s Child. These floating test beds became the basis for many of the innovations that appeared in Hunter production models, including B&R rigs, arches and water ballast. It was on Feb. 12, 1989, that Luhrs brought Thursday’s Child under the Golden Gate Bridge and into history, marking the end of an 80-day and 20-hour voyage from New York around Cape Horn. The time beat by eight days and 12 hours the clipper ship Flying Cloud’s 1854 passage at the height of the Gold Rush. Flying Cloud’s time of 89 days and 8 hours had stood for 135 years. The love Luhrs had for the outdoors might have been a manifestation of his desire for solitude and reflection, Markatos says. In 1968 Markatos and Luhrs set out for Alaska for the summer in a Volkswagen (one of a handful of trips), largely living off the land in an area that had seen little development. “If we spent two weeks together, he’d decide to strike off on his own,” Markatos says. Luhrs decided to head to Point Barrow, the northernmost point in Alaska, and spend the the summer there while Markatos traveled around the rest of the state. “I think Alaska was kind of his calling, to a certain degree,” Markatos says.